Landscape DesignWhat is urban garden design? Houston townhome and patio homeowners do not have to deny themselves the benefits of landscape design just because they have small yards. Urban garden design can beautify even the smallest of yards with an expanded sense of space feels diversified, interesting, and free. Urban garden design builds around a central focal point according to the principles of minimalism and selectivity. There is never that much room to work in one of these small gardens. A minimum number of elements must be used to avoid overcrowding the area. Plants must be carefully selected to support the basic geometry of garden borders, hardscape design, and water elements that are built into the form. Focal points can be any number of things that center the garden aesthetic. Focal points are particularly important in this style because the vertical impact they contribute lends a sense of importance to the entire design. Focal points can be created with unusual plants that represent the combined aesthetic of other plants. Typically, shrubs or small ornamental trees are used for this purpose because they grow somewhat taller than surrounding ground covers and low-growth shrubs. In some cases, though, we may create a cluster of plants in the middle of the garden and use a variety of other elements to point the eye to the culminating focal point. Other urban garden designs center around ornamental elements. Fountains, statuary, and abstract art have all been used successfully to center these highly custom designs. In fact, modern and contemporary gardens often use a combination of steel, mirrors, and water to create a magnified center that helps make surrounding garden elements appear uplifted and enlarged. 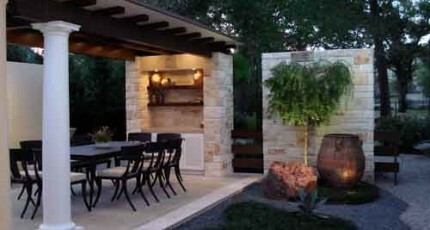 Such elements can include decorative gravel and ornamental rocks that contribute geometry and vertical impact. They also require no maintenance and help conceal any irrigation and drainage systems we have to design to support plant life. 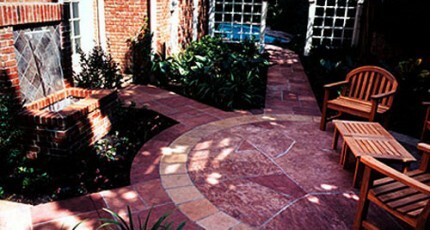 If the garden is large enough to stand or sit in, a small patio or walkway can be part of its design. If not, miniature stepping stones, bricks, or ornamental concrete pads can be laid down to create the illusion of a traversable hardscape that can be enjoyed from a vantage point next to the garden. The plants that we use are normally slow growth so that minimal maintenance will be required to maintain the garden’s shape. There are many ground cover species, shrubs, and small ornamental trees that are suitable for this purpose. Ornamental grasses are also used in places to add a sense of motion to the garden borders. Water features are frequently integrated into urban garden design. Fountains, ponds, and miniature streams add fluidity, reflectivity, and vitality to their surroundings. None of these elements ever have to be all that large. They simply have to appear large in comparative scale to the surrounding structures and plants in order to successfully complete the design. Urban garden designs can be developed in the image of any garden style in order to support both traditional and eclectic townhome, patio home, and single family home architectures. 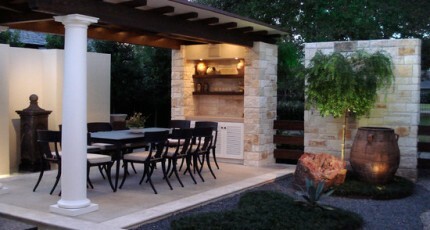 Normally several gardens are built in the front and back yards of such a home and then interconnected with a series of patios and walkways that link the different gardens into a comprehensive, custom Houston landscaping plan that adds curb appeal to the entire property. September 28, 2015 in Landscape Design, What is urban garden design? September 24, 2015 in Landscape Design, What is urban garden design?